I’ve been a knitter for most of my life, which is getting to be a long time now. Obviously, I get a lot out of it, or I wouldn’t still be stitching away. Nearly every day, at least a little. Knitting has taught me lots of lessons. How to concentrate. How to imagine and visualize. The value of perseverance. The simple pleasures inherent in selecting and touching yarns, and in watching the shapes and colors develop. The joy of making gifts for those you love.The creative process of seeing a length of string transformed into something beautiful. The value of patience. But to distill an actual philosophy….. Anyway, here is Katknit’s own knitting philosophy, for what it’s worth. Wherever it goes, wherever it takes you, enjoy. Happy knitting. This afternoon I read a little blog article about the reasons why the blogger knits. That got me to wondering why anyone knits, when it’s easier, faster, cheaper, etc. just to buy knitted stuff. Well, I know why I knit. It’s fun. Relaxing. Creative. Satisfying. Meditative. Productive. Beautiful. Peaceful. Colorful. Cozy. So why do you knit? If you’re so inclined, and I hope you are, please post a short comment telling us what it is about knitting that got you hooked and keeps you in yarn. For years now, schools across America have had to cut such valuable subjects as Home Ec (frequently called Consumer and Family Science, la di da) in favor of spending more time on the basics. Well, as a psychologist I know that there are countless ways to learn and strengthen the basic skills, so this morning I was pleased to come across an article about how a private school in Pennsylvania is making knitting and sewing an integral part of their curriculum. At the Waldorf School, kids from kindergarten through fifth grade scrutinize their knitting, crocheting and sewing projects like students elsewhere might examine computer programs or graphing calculators. The private school in Bloomfield, Penn. — one in a network of more than 900 schools practicing Waldorf Education worldwide — is founded partly on the principle that forms of handwork such as knitting, crocheting and sewing are critical to a child’s intellectual and emotional development. Every child in the school has two 45-minute handwork lessons per week. Kindergartners do projects such as sewing pouches for treasures found on nature walks. 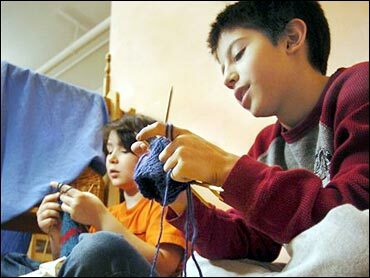 Fifth-graders spend much of the year knitting socks. Students learn math, spatial and geometric skills in knitting and sewing, whether it’s first-graders counting stitches in each row of their scarves or fourth-graders creating and embroidering geometric patterns. Taking on a project like a scarf also helps teach first-graders to manage frustration and understand that mistakes are a natural part of the learning process for everyone. The culminating project in fifth grade is a pair of socks — something that takes the students nearly the whole year to complete. Imagine the sense of accomplishment! The author of the by now infamous travel article complaining about a knitter on a jet flight has felt compelled to respond to the howls she’s been targeted with by the knitting world. Her rejoinder is very witty in a punnish sort of way. NOTE: The response from the knitting community to a Travel column about the absurdity of allowing some carry-on items while banning others knocked us for a loop. Some of the responses actually left us in stitches. Yet we thought Jill had spun a good yarn. Here, she hopes to “selvedge” her reputation. Well, I must admit I was even more surprised by the reaction to my column about the seatmate wielding knitting needles than I had been by the fact that knitting needles were allowed into the airplane cabins in the first place. Hmmm. Wonder how she heard all those little clicks over the sound of the jet engines…..
“I wriggled away from our common armrest to make room as she bent over and rummaged in her cavernous carry-on. But what she eventually retrieved demanded closer inspection. Were they …? 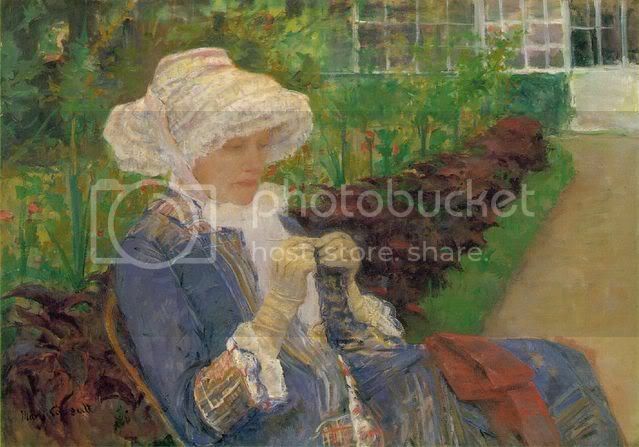 Yes, the woman was … knitting. “Do you knit?” she was asking our row-mate by the window, a twentysomething listening to her iPod. I am not a betting person, but I’d have staked my dog’s life on the answer. The needles hissed and clicked at an alarming rate. Their relentless rhythm was, I’m sure, barely audible, but it had become some Poe-like pounding my ears could not tune out. Suddenly, this woman, despite her earth mother attire, despite even the glow cast upon her from the overhead light, had not a trace of angelic. This travel writer must have used extendable ears. For the past few days, there have been comments flying around the knitting net about Knitler and other dolls representing various dictators and tyrants of the world. Most people express a sense of outrage that anyone would do such a thing. Some people, far fewer, see humor in it. This controversy reminds me of a previous one that arose when Mel Brooks’ The Producers was initially released, as a film. I clearly recall an opinion that someone, perhaps Mel Brooks himself, or maybe it was Gene Wilder (both Jewish, by the way), offered, saying that the best way to diminish the reputation of a person is to trivialize or ridicule him/her. By showing the world that the person in question is a mindless, mad, demented sort of individual, his power, once awesome, is negated.Cut down to actual size, so to speak. I don’t know why the designer of these knitted dolls dreamed them up and executed (no pun intended, but perhaps it’s apt) their images in yarn and stuffing. Perhaps she simply wanted notoriety and word of mouth advertising for her business. That’s what has resulted. I for one do not find these figures offensive. Other monsters are produced as toys for kids to play with. GI Joe and Barbie offend some folks and not others. Anyway, to each his own, and the comments that my blog post has received are all posted, with the exception of those that are sownright insulting. Personal attacks, except upon Hitler, are never published here. Do I like the political tyrant dolls? No. Do I think they’re funny? No. Would I knit one? Only if I had a specific political use for one. But if someone else likes them, is amused, or wants to make one, that’s up to her/him. LIttle knitted dolls cannot improve the legacy of these monsters. 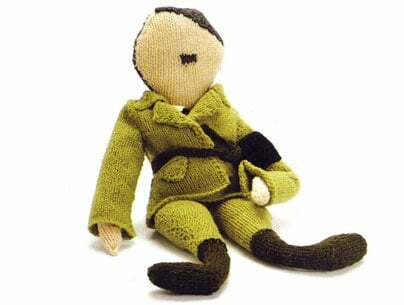 Knitted Hitler: Knitler, that Knazi! Uh oh. He’s baaack! First in wax at Madame Tussaud’s and now in wool. That’s what I call subversive knitting. Read all about it in Telegraph.uk.